Cavern diving in Gorontalo offers a safe alternative to technical cave diving. 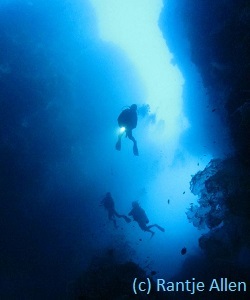 Diving in a cavern means that you are in an overhead environment. However, you can always see how to exit. Most involve entering only a few meters into the cavern. Many provide round frames for underwater photography. We list five dive sites that feature caverns and overhangs. Jinn Caves Dive Site makes a lasting impression on even the most experienced of divers. Some call it dramatic. Others say, “Hair-raising!” Patient divers can spend an entire dive probing its many secrets. When cavern diving this site with Miguel’s, we like to start along the ocean-facing coral wall. A strange sunken cavern marks the beginning of this site. Its depth is about 18-meters. Next is a point riddled with holes. Lionfish like the hover here. A pair of narrow channels cut vertically into the wall. A ledge leads behind a point. Under an overhang, hanging rope sponge decorate the wall. The main cavern backs 33 meters into the rock ending in a tiny cove. A cascading slope with huge drops at depths of ten, 17 and 20 meters form its back and bottom. The back and steep bottom are covered with mud mixed with sand. The roof of the main cavern is split, letting in sunlight. It measures only five meters wide at its narrowest point. At this narrowest part, the two inner-facing walls form complementary overhangs. While cavern diving here, be sure to look up for a stunning view. The coral reef rises to the surface here. The split gives access to a narrow cove. In this arid section of Gorontalo, rain rarely produces runoff. Over time, water has drained down from the mountains. Its erosive force has carved the split in the soft limestone. It also created numerous caverns inside the main one. Inside the main cavern, two deep pinnacles block access to a cavern eroded back into the eastern wall. Marine life inside the cavern is different from that living on coral wall. Look for juvenile batfish near the surface. Twinspot chromis (Chromis elerae) and rare Randall’s anthias (Pseudanthias randalli) love the darkness. 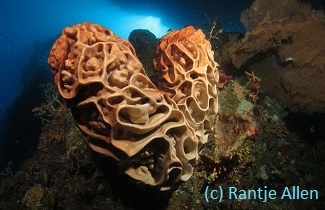 They often seen while caverning diving in Gorontalo. Burgess butterflyfish (Chaetodon burgessi) love both darkenss and depth. Divers rarely see them, except a cavern diving sites in Gorontalo. A new species of goby was discovered and named after the Japanese emperor (Exyrias akihito, 2005). It can be seen in Jinn Caves. In other parts of the world, it typically lives in water too deep for most divers. The dive site is about 150 meters long and 33 meters deep. Conditions: Because of the sand and mud bottom, visibility can vary. A heavy rain in the mountains can cause 20-meter clarity one day to plummet to ten meters. Lower visibility adds to the mystery of the site. Special Note: Jinn are the often-malevolent spirits created from fire mentioned in the Qur’an. The largest Jinn Cave is filled with bats and requires a stiff hike up the mountain above the dive site. Pass along the vibrant reef crest. Descend along the coral wall, studded with giant sponges. At fifteen meters, notice a wide ledge carved into the surface of the wall. Its edges are dotted with anemones, sparkling in the sunlight. Following the ledge downward, the dive guide signals your descent and sinks into the darkness below. Leaving the wall behind, divers now lack any visual reference. The dive gauge heads toward the 30-meter mark. Suddenly, a wall appears. Black coral trees and sea fans grow massive in the quiet gloom. Far below 40 meters and clearly visibly is the wall’s bottom edge. It ends in a sloping muck bottom. Flick on a dive torch and Jinn Caves dive site comes alive with color. 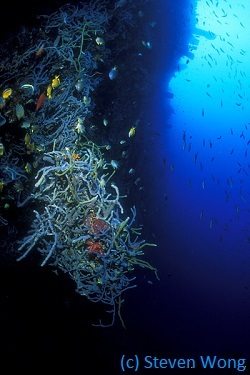 This dive site is one of the few in Gorontalo where divers can clearly see the bottom. It is a slope of white sand mixed with coral. The coral wall begins at the surface of the ocean. The wall drops to about 15 meters where it meets the slope. The wall is highly carved with numerous small caverns, even as shallow as five meters from the surface. Narrow channels are cut in the coral reef flat. The white sand in them spills down the wall. 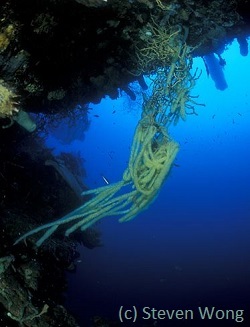 Hanging tunicate colonies and sponges are common. For those cavern diving with good buoyancy skills, a swim-through is available. The site is about 250 meters long. Conditions: Because of the white sand, visibility can vary. Wave action can cause 20-meter clarity one day to drop to ten meters. Miguel’s Diving staff will not choose this site if visibility is less than 15 meters. Special Note: If you decide to swim through the tunnel, please gather your gear together. Swim slowly, moving your fins side to side. Stay close to the bottom, so as not to damage the marine life inside. Descend past a coral point swirling with fish in the long shore current. 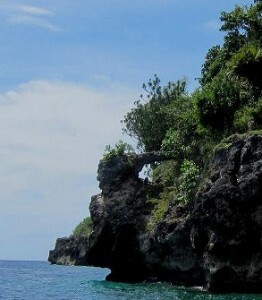 Swimming in the direction of the protected cove, notice the dramatic white sand bottom flanked by dark shallow caverns. Your dive guide points out the long white plume of a Foxtail colonial tunicates. Numerous large clams grow on the wall. In a small hole with sandy bottom, a Sailfin shrimpgoby (Amblyeleotris randalli) stands guard. The pair of shrimps that live with this goby emerge from their shared hole. They are pushing pebbles and sand away. In the swim through, hundreds of sweepers and cardinalfish gather. After thirty minutes, divers turn back and explore the upper portion of the site, discovering dramatic cavern diving at depths of only five to ten meters. This unique site rounds a cliff that faces the deep ocean. The shallow flat is only three to five meters deep. The coral wall starts between zero and ten meters from the cliff overhead. This coral wall rarely receives direct sunlight. The reason is the angle at which the cliff pushes into the sea and the closeness of the mountain above. In this twilight, the dense corals of neighboring sites are replaced with sponges, tunicates and other encrusting marine life. The colors are dazzling. The cliff directly faces the heavy surf from east winds. This has and continues to cause cavern formation, falling boulders and rocky reef surface. Cavern diving here is especially good for wide-angle photography. This dive site is about 450 meters long. Conditions: The shallow flat can have a moderate to strong current. Strong currents at the top or heavy wave action can cause down currents. Miguel’s Diving does not take anyone cavern diving here at those times. Heavy rains or days of heavy surf can reduce visibility. Typical visibility is 15 meters. Special Note: Bring your underwater torch to search the wall’s many holes and enjoy its dramatic colors. Also remember to glance away from the wall towards blue water. Pelagics often pass this site since the wall falls immediately to 120 meters. Descend along the eastern most corner of the wall to a corner with a pointed overhang. A pair of knobs sit at about a 30-meter depth. Watch several full-sized Dogtooth tuna (Gymnosarda unicolor) rush past. At a depth of 25 meters, a round cavern beckons. Cavern diving here is safe because this cavern is only a few meters deep inside. So, switch on your dive torch. After rounding two corners in the wall, notice the splashes of white all over the reef. Miguel’s Diving calls this White frosting colonial tunicates. They cover barren surfaces. They are only found at Shadowlands dive site. From here you pass a garage-sized cavern, also at 25 meters. If your computer allows for cavern diving at that depth, go ahead and enter. Above the “garage” is a roadway cut into the wall. Its depth is about 15 meters. The wall bends four times before divers encounter a startling cut in the wall. It leads all the way back to a tight cavern the reaches under the mountain above. Inside you can hear the pounding of any waves above. There are so many holes in this area that fish swim in and out of the wall! Nudibranchs are often found here, particularly Loch’s nudibranch (Chromodoris lochi). 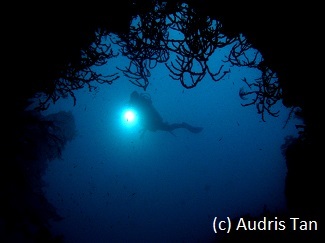 This classic Gorontalo dive site looks like no other. The first 100 meters of the wall is mostly overhang with shallow caverns. Masses of hanging rope sponge hang in the gloom. A narrow ledge edges the wall bottom. It is covered in silt. Numerous large sand gobies live here. In several places the wall bottom pushes in, creating dimly lit shallow caverns. The rest of the site is coral wall with a steep slope below 35 meters. Black coral bushes and numerous sea fans live in these deep waters. Divers can find several large Salvador Dali sponges (Petrosia lignosa). This species of large sponge was discovered in Tomini Bay in the 1920s. It is only found on deep walls in Indonesia. However, those with wildly carved surfaces are distinct to Gorontalo. The site reminds underwater photojournalist William Tan of Lembeh’s Nudi Falls because of the “extremely messy layout.” Macro photographers will find plenty of crabs, shrimps and nudibranchs to shoot. The site is about 240 meters long. Conditions: Visibility varies considerably from a few meters to 30 meters. The first section of wall is dimly lit because of overhangs and the cliff above. Heavy surf or rain can churn up the silt. Usually, visibility along the coral wall is excellent unless a cold upwelling brings silt with it. Occasionally, a moderate current will exit the tiny bay. Special Note: Those cavern diving here need to monitor their depth gauge or computer. Those who follow the bottom of the wall along the silt shelf can easily become absorbed in exploring the caverns. The downward slanting bottom is deceiving. It quickly falls below 30 meters. Wise divers will use frog kicks here since any downward fin kick will stir up the silt bottom. Descend near a huge boulder that has fallen off the cliff onto the shallow coral shelf. The wall bottoms out at 18 meters where a huge sea fan grows at the entrance of a large shallow cavern. Peering cautiously inside, divers see tangles of rope sponge hanging from above. Look for the long white plumes of Foxtail tunicates. Following the bends in the wall, explore dimly lit nooks with your dive torch. On the gloomy silt bottom, a lone crinoid crawls in search of a suitable perch. It waves its feathered arms as it moves. A large goby eyes the human intruders before disappearing into its hole. It leaves a cloud of silt behind. With the wall bottom quickly falling below 30 meters, explore the walls above. In its cracks many orange Deep sea fans live. Notice several huge black coral bushes far below. Maroon and purple striped fish play among the hanging rope sponges. 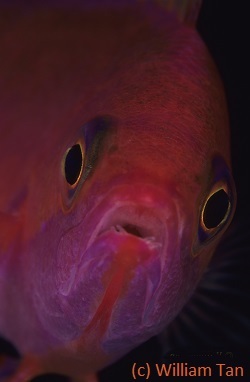 They are male Randall’s anthias (Pseudanthias randalli). This species is seen while cavern diving because it thrives in shadowy areas. A shy Blue-spotted puffer (Arothron caeruleopuncatus) hides behind some coral. Despite its large size, this puffer escaped notice until being named scientifically in 1994. In a crack in the wall, notice the Salvador Dali sponge. It is white because sunlight never hits it. Miguel’s Diving staff call such sponges albinos! Visibility and light improve as the overhang becomes a coral wall. Enjoy plenty of tropical fishes. After touring a long finger of coral, passing coral knobs, and exploring huge cracks in the wall, ascend near the reef crest for your safety stop. Curled under a small colony of Acropora coral, a single Snowflake moray (Echidna nebulosa) smiles at you. This dive site centers on a tiny inlet measuring only six meters wide. The site gets its name from a rock formation that resembles a helicopter. The inlet penetrates about 65 meters into the coral wall. Cliffs rim a rocky beach. The inside walls feature several shallow caverns, a skylight punched into the reef crest and overhangs. The sand and silt bottom provides home for marine life rarely found elsewhere in Gorontalo. This includes flounder, large sand gobies, some amazing nudibranchs, and the spooky Estuarine stonefish (Synanceja horrida). The exit to the wall features a deep cavern tucked under the bottom of the wall. A unique double tunnel makes a great frame for underwater photographers. It not large enough for divers to pass through without damaging the marine life inside. The site is about 65 meters long. Conditions: Currents are seldom an issue. Visibility at this site rarely exceeds 15 meters since any wave action will stir up the silt bottom. Any wind will usually make this site unreachable for divers. Special Note: Be extremely cautious about walking around in the shallow waters of the inlet. It is home to Estuarine stonefish (Synanceja horrida). Most marine venoms break down with heat, including that of this fish. Applying hot water compresses is a good first aid treatment.